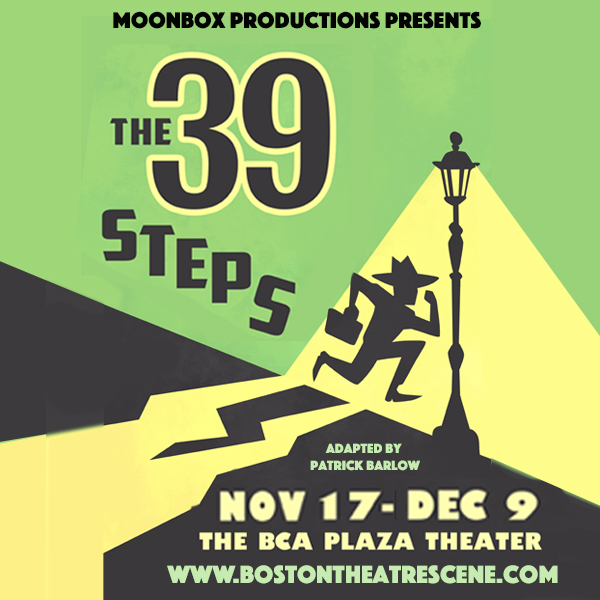 The 39 Steps, by Moonbox Productions, runs November 17 to December 9, 2017 at the BCA Plaza Theatre in Boston, Starring Kevin Cirone, Matthew Zahnzinger, Bob Mussett, and Sarah Gazdowicz, with Producer Sharman Altshuler, Director Allison Olivia Choat, Assistant Director Arthur Gomez, Stage Manager Amy Lehrmitt, Assistant Stage Manager Emily Cuerdon, Set Designer John Paul Devlin, Lighting Designer Jeffrey E. Salzberg, Costume Designer Erica DeSautels, and Sound Designer Dan Costello. In The 39 Steps, Richard Hannay is an ordinary Englishman, minding his own business, when a mysterious woman falls into his life. He finds that she’s a spy who entangles him in a mystery to save Great Britain against the Nazis! The 39 Steps is foremost a comedy, based on a book in 1915, but updated to the pre-war 1930s. The show is quite rightly described as like Monty Python. It’s silly and laugh outloud hilarious. The cast “break the fourth wall”, winking at the audience, and much of the humor comes from watching the four actors struggle to put on the play. They run around setting up staging, sometimes after it’s needed and the other actors must wait. When characters walk through a door, the actors must then reset the door to represent that they’ve now entered a room. Much of these stage changes are clearly pointless, which adds to the laughs as the actors frantically try to set everything up. Matthew Zahnzinger, who reminds one of John Lithgow, steals the show in some 20 different roles, and all together some 32 roles are represented by the four actors, often using exaggerated funny accents, or playing cross-gender. The costume changes lead to running back and forth, and backstage, with exasperated actors mock upset at each other. You’ll also find creative physical comedy, as the characters lie to each other. One character tries to hide his handcuffs. The show even features “sheep”. Some of the gags were overdone, such as misunderstanding the Scottish accent, or the music around Alt-na-Shellach. Staging, lighting, and props were minimalist by intention, with a few boxes and door frames serving as the bulk of the set design by John Paul Devlin. One scene on a train is illustrated just with chairs and ladders, and I didn’t quite get what happened at the end of the scene, or when the hotelier goes out to the barn. With so much happening so quickly, and different character changes, more fleshed out scenery would have been helpful. And with so much physical comedy, too many props were basic or mimed. Give the actors a real sandwich and some apple juice in the decanter. The guns could have a confetti effect or shoot a flag that reads “Bang!”. Sound effects sometimes came in too quiet. The physical comedy was genuinely funny, with brilliant acting — for example, an entire train chase done in pantomime. But a few opportunities for physical comedy were also bypassed that may come as the show gets polished through its run. The dance could have been a jitterbug. The pail could have been a fishbowl. The missing finger could have been the middle finger. Our main hero, played by Kevin Cirone, is dressed as a well-dressed, rugged protagonist, but he’s supposed to be more a hapless everyman, a Michael Palin type, who simply falls into trouble. Possibly I’m losing my mind, but even in a small space, microphones might have been helpful. I found myself straining to hear the actors at times, and this tension made it slightly harder to relax for laughter to come. I was so excited to review this play that I went on opening night. This was a terrible idea, as a show will of course get better throughout its run as each performance acts as a rehearsal for those to come. So I forecast with confidence that some of the problems I saw will disappear, making the show tighter and even more hilarious. For example, the actors rushed through their lines in Act One but, after the intermission, were perfect in Act Two. The show features a strong cast including Sarah Gazdowicz and Bob Mussett, a truly unique script, and even some moments to remember for a lifetime. You’ll find yourself mimicking the accents and telling all your friends about this show. That gag with the sheet music stand was just one of the many scenes where I couldn’t stop laughing. I’m pleased to give The 39 Steps a nearly perfect 4.5 stars. Some rich investor needs to swoop in and give Moonbox Productions full funding for their next show. This is a theatre company deserving more recognition. See The 39 Steps at Moonbox Productions and the Boston Center for the Arts.